After you populate the profiles of dozens or hundreds of contacts on your Galaxy S6 by linking or manually entering them, you’re rewarded with a great deal of convenience. 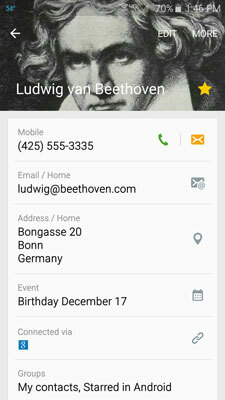 Start by tapping a contact. You see that person’s profile, as shown in the following figure. Tap the green telephone next to the number to dial that number. Tap the amber message icon to send a text. Tap the e-mail icon to create an e-mail. About the only thing that tapping on a data field won’t do is print an envelope for you if you tap the mailing address!